The pursuit of relevance is a fundamental, albeit sub-conscious, driver in what we think and do in our personal and work lives. All of us have this relevance imperative wired in to our brains. It is a characteristic of human life, and perhaps all life. I claim no expertise in psychology or neurobiology, but it makes sense to me to think that our brains relevance imperative probably started as desire to belong to a group or tribe as a strategy for safety and survival. Over time, it has evolved, adapting to the demands of increasingly more complex social contexts. Today, the relevance imperative drives our behaviors and actions across the full range of human needs from safety and survival, through belongingness and love, to the achievement of self-actualization. We pursue relevance in our social and work contexts by seeking, creating, and nurturing, meaningful connections with others who have the same goal. Those connections, built with, and lubricated by, trust, empathy, and generosity, become the pathways through which pass the critical commodities of every human system… information, knowledge, empathy, ideas, and inspiration. Our businesses and organizations rely on the effective and efficient movement of these commodities. 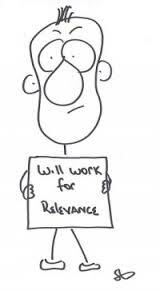 In the workplace, aberrant perceptions of personal relevance will dramatically impact the thinking processes and behaviors of an individual, and over time, negatively impact the organization as a whole. When people feel irrelevant, fear and low self-esteem dominate them, and degrade their situational awareness, focus and judgment. At the other extreme, if they somehow perceive themselves as “super-relevant” they will become dangerously over-confident, arrogant and narcissistic, producing equally negative impacts on the organization. While most of us operate, most of the time, within these two extremes, it’s not uncommon for people to experience at least temporary damage to their feelings of relevance as the result of a careless comment or action by a co-worker or manager. There is nothing more hurtful to an individual than to receive a direct or implied communication that they themselves, or the work they do, are irrelevant to the organization. So…how can we use these insights to be better leaders, followers and teammates? – Exercise greater mind/mouth control to avoid those occasional thoughtless comments, made in a moment of anger or jest that impugns the relevance and value of others. This entry was posted in Best Practices, Better Thinking, Leadership, Life, Personal Development and tagged brain development, decision-making, happiness, leadership, neuro-science, trust, workforce. Bookmark the permalink.